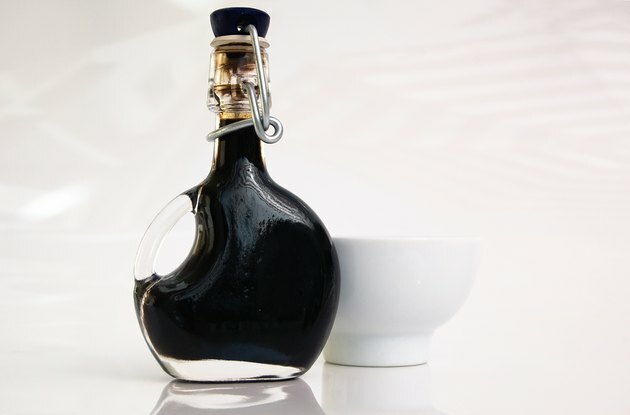 What Are the Benefits of Black Vinegar? Cassie M. Chew is a multimedia journalist who covers politics, health care, education policy and technology news for print and online newspapers, magazines and trade press journals. When she's not pursuing a story, Chew enjoys independent film, biographies and books about nutrition and health. She holds a Master of Science in journalism from Northwestern University. In addition to its usage as a condiment in sushi and other Asian dishes, black vinegar, also known as brown rice vinegar, is used in Japanese and Chinese culture as a health tonic. Made from unpolished rice, black vinegar takes from one to three years to ferment. During this process, the vinegar darkens, its flavor and aroma become more intense and the vitamin, mineral, amino acid and other nutritional content increases, vinegar and Asian nutrition experts say. Because of its reported health benefits, many in Japan and China make a drink concocted with black vinegar part of their daily diet. Health experts say that amino acids and other nutrients in black vinegar help counter the effects of lactic acid buildup in the blood, which can cause fatigue, irritability, sore muscles and disease. Black vinegar detoxifies the body, balances pH levels and improves digestion, according "Healing with Whole Foods," written by Asian nutrition expert Paul Pitchford. Black vinegar also is said to boost energy levels and improve mood. Citing anecdotal stories, Cal Orey writes in "The Healing Powers of Vinegar" that black vinegar helps relieve constipation and clear the sinus passages. The high level of essential amino acids present in black vinegar is responsible for its positive impact on cardiovascular health, health experts say. Black vinegar helps prevent formation of substances that contribute to aging and plaque buildup on blood vessel walls, John and Jan Belleme write in "Japanese Foods That Heal," citing studies by a Japanese researcher. The warming nature of black vinegar enhances blood flow and improves circulation, Pitchford writes. Nutrition experts also say black vinegar can be a remedy for high blood pressure. In his book, Orey includes anecdotes that claim black vinegar, used topically as a skin dressing, helps heal fractured bones and relieve pain from sprains. Black vinegar also disinfects cuts and insect bites and has been used to cure athlete's foot, write John and Jan Belleme. In "Vinegars of the World." author Lisa Solieri writes that Asian cultures have used rice vinegar as a food preservative. What Are the Health Benefits of Indian Black Salt? What Are the Health Benefits of Mother of Vinegar?